Fresh off touring with Portugal. 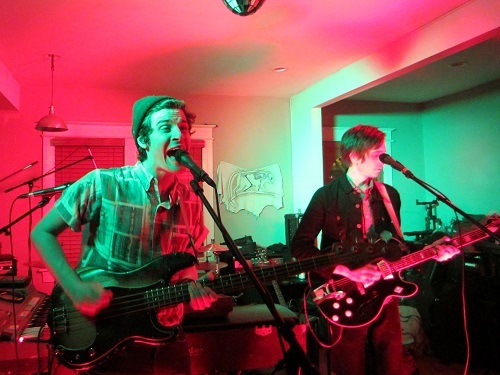 The Man and Dan Croll, The Dig have just begin a new headline tour of themselves. To celebrate this, they’ve released an animated video for their most recent release. It’s special because it’s a cover of The Kinks’ ‘People Take Pictures of Each Other’, available now. Its promo video, created by James Kerr / Scorpion Dagger, pokes fun and takes full advantage of society’s current preoccupation with selfies. Watch the video for The Dig’s cover of The Kinks’ ‘People Take Pictures of Each Other’ below. For more on The Dig on TGTF, follow this link. If SXSW Music was a car, the car will have just started on Monday night, followed by a solid, chugging purring as it was running on Tuesday. The worst clashes start Wednesday, when things really are in full swing, all the venues are open and are putting on their showcases. I knew what I wanted to see on Tuesday night, but the problem was I wanted to be all over the place! Los Angeles firm Force Field PR was putting on a showcase at the outdoor stage at Cheer Up Charlie’s, and it was a bonus that they were beginning before the magic hour of 8 when most showcases begin for the evening. Cheer Up Charlie’s is one of the more unusual venues at SXSW, as you’re watching a band perform up against what looks like a mountain of boulders that could come down raining on them (and you) at any moment. 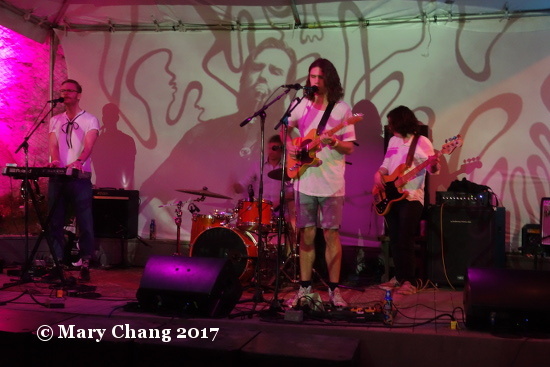 The timing of Copenhagen band Rainbrother’s set was also fortuitous, as it seems many people I knew from the UK had stopped in to see them, including Steve Lamacq of BBC 6 Music, who included them in his on the ground reporting from Tuesday night at SXSW 2017 (go to 19 minutes 30 seconds on this programme of his; it appears that I may have accidentally bothered the man when he was trying to interview Slaves outside Barracuda on 7th Street, oops). What would have struck you immediately coming into this Tuesday night show was that there was a man projected larger than life behind them. With a guitar and a microphone, I wondered what the deal was. I thought maybe it was one of these cool, new-fangled technological advances because, well, all Scandinavians had mobile phones before we did, right? …and then he told us. Lead singer Bjarke Bendtsen’s artist visa had been denied. The band’s solution: before coming out to America, the band videotaped Bendtsen performing alongside the band for their entire set, so they could project his image and sound while they played without him physically being there in Austin. While Bendtsen eventually made it to Austin for the band’s last 2 shows in the Texas capital, the stark reality that strange, nonsensical decisions about artists being able to perform in America sunk in. I give full props to these Danes for soldiering on without their leader and sticking it to the man. What might have simply been a perfectly agreeable performance by a Scandinavia dream folk band became an act of defiance. As one of my best bets of Scandinavian acts coming out to Austin this year, I couldn’t have been prouder of them. One of the great things about SXSW is the fact that unlike Canadian Music Week or CMJ, venues are actually pretty close to one another. Although I could not spend my evening solely at the felte / Part Time Punks showcase at Barracuda that I enjoyed last year, I did stop in to check out Philadelphia’s Suburban Living on the indoor stage. 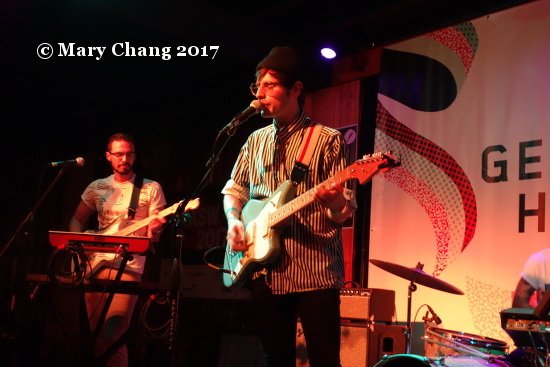 Bespectacled Wesley Bunch leads the band, which as a unit remind me of the sweet, twee pop tones of The Pains of Being Pure at Heart. You can check out Bunch’s full album from last year ‘Almost Paradise’ on most streaming services. 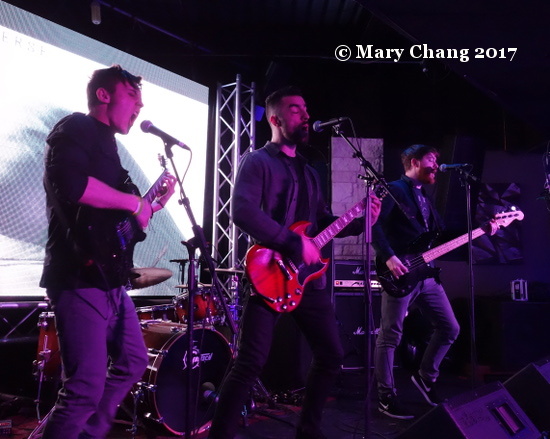 When I finally made to Scratchouse for the Killing Moon / ReverbNation / Metro newspaper showcase, I was ready to be surprised by the first acts of the evening on both stages there, neither of which I had had an opportunity to research properly ahead of time. 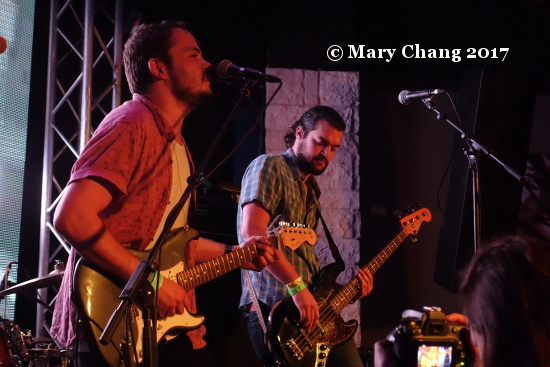 Seems like Nashvillians Future Thieves already had fans in Austin, as they played to a packed house at the indoor stage, their country-tinged pop hitting the spot. Check out their new single ‘Sucker’ below. I then went to check out the backyard stage, where a band had already started their set. Dude with a big beard…hmm… he looks familiar… Then from the stage came “We are Mt. Wolf!” Yep, that’s Sebastian Fox, all right! New York’s Henry Hall had unexpectedly pulled out of the evening, and Mt. Wolf helpfully stepped in to help the hosts fill his slot. That’s another thing that you will oddly find: there will be one or two bands that you’ll see several times during the week without even trying, as if it’s serendipity. While I’ve always imagined Mt. 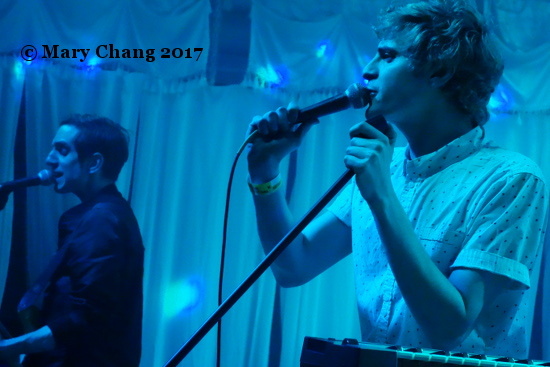 Wolf’s synthy goodness with combined harmonies working well in a club, their sound didn’t quite fit with the American backyard party feel. With the staggered start times, it wasn’t long before the next band on the indoor stage went on Tuesday night. This Be the Verse has already received high accolades and plenty of attention from Kerrang!, which should tell you something about their music immediately. Yes, This Be the Verse is loud, industrial rock music from London, and it’s not for the faint of heart. The comparison to Nine Inch Nails is well deserved. Not for everyone, but I could see our former writer John Fernandez headbanging to their music. I popped out briefly from Scratchouse to get a taste of something different and more importantly for this nonsmoker, some air. I ran into my friends, New York band The Dig, as they were loading into Swan Dive for their 10 o’clock show. Bass player and sometimes lead singer Emile Mosseri is now sporting the platinum blond look, and I guess he wanted a different appearance to match their new direction on most recent album ‘Bloodshot Tokyo’, released at the start of February on Roll Call Records. While band member Erick Eiser has played keyboards on their past LPs, a synthesised organ sound is prominent on ‘Bloodshot Toyko’ tracks like ‘Simple Love’, which seems to reflect more whimsy in their songwriting process. It’ll take some time for me to listen to the new LP and compare it with their past releases like ‘Electric Toys’ for me to decide if I like the new direction. Swinging around the corner, I checked out the activity at Swan Dive Patio, where Oscar Key Sung from Melbourne, Australia was setting up. 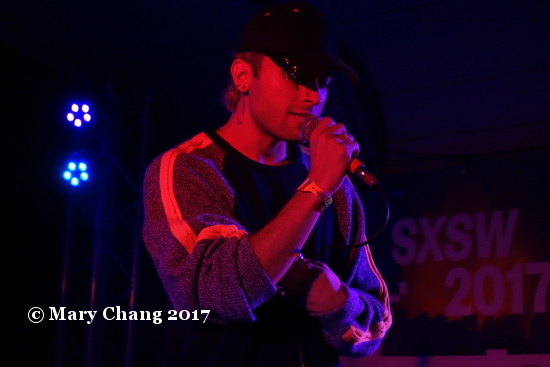 R&b and electronic elements often get mixed together these days into predictable pop formulas, but this artist on my list of best bets of the Aussie acts coming out to SXSW 2017 goes weirder, with amazing result that (probably) only an electronic geek could love. Hiding under a baseball cap, Sung’s grooves and vocals leaned soulful, the tunes feeling much more accessible live than they are presented online. I was thinking to myself the other day that it’d been a long time since I saw a show at Black Cat Backstage and when I looked it up, I was right. The last time I had passed through Backstage’s door, it was just prior to SXSW 2014, to see Public Service Broadcasting on a chilly winter night. I’d no way of knowing it at the time of course, but in 2 weeks’ time, I would become a different person. This past Thursday evening, it was another cold winter night, but I’d be seeing three American bands, including one I’ve had the great pleasure of see evolving over the last couple of years, and playing a packed room too that could not have made me happier for them. The first of the two local openers for the night was Pree. If you’re wondering where their unusual name is from, singer/guitarist/keyboardist May Tabol took inspiration from the Neutral Milk Hotel song ‘A Baby for Pree’. You can’t draw any obvious comparisons to Jeff Mangum’s band to this one though. The band stars Tabol, guitar Michael Zepeda, bassist Ben Schurr and drummer Ben Usie. They’ve definitely got a unique, at times whimsical sound. It’s like a space-rock filter has been placed on top of a Little Comets‘ sonic landscape (check out the wonky main melody and those guitars on latest single ‘Two Feet Shy’ that sound like Mickey Coles is playing them). But they’ve got some cutesy, twee vocal lines too. They’ve got a new album, ‘Rima’, scheduled to be out in February 2015 on Paper Garden Records, so stay tuned for that. The second opener was another local group, the inexplicably named The Sea Life. I say inexplicably, because at least two of their members are from the suburb I was raised in, so I know they were miles and miles away from any sort of seaside. Frontman Jon Weiss not only has an epic hipster beard, but he’s also quite funny, making jokes throughout their whole set with their drummer and clearly a close friend Ryan Witt, who I understand is their newest member after their original sticksman departed in 2013. It’s been bothering me that one of their songs sounds just like something I used to hear a lot on 6music but I can’t put my finger on it. So I’m just going to have to compare them to the burgeoning (and popular) slacker rock scene we’re experiencing right now, which leads to the assumption they’d be a hit in the UK. There is a melody to their songs but with his voice, Weiss takes poetic license to let the vocal not follow any set line. The guitar effects used can run to the psychedelic, but the impression I get is they want to leave a dreamy feeling on their audience. Judging from the squeals and shouts of excitement from punters, they’ve already got a loyal DC following. So, now to the headliner, The Dig. I first saw the Brooklyn-based band open for Editors in February 2010 during my second year of being a music journalist, and we’ve been friends since. Their latest release, the 2013 ‘You & I’ EP, sees the band taking a more dreamy approach, as evidenced by the echoey guitars dreamier vocal stylings, including bassist Emile Mosseri employing a falsetto more frequently. Despite the name that seems to suggest a theme of togetherness, it’s really a six-track tour de force of loneliness. EP standout ‘Tired Hearts’, with Mark Demiglio’s understated drumming and an emotional guitar line, was a clear standout of the night; despite the modesty of the track on record, you could feel the electricity of it live. The relative darkness of their set – they turned out all the lights in a room except for a few they themselves had brought and set up on stage – seemed to be sympathetic to the vibes of the EP, but it made for impossible photo shooting conditions, so apologies, I don’t have any good photos of them from the night. 2012 album ‘Midnight Flowers’ is a much more raucous affair and includes hard-rocking gems. ‘Black Water’ is one of these, and having not seem the Dig since August 2013 (then opening for Little Comets at the Hamilton), I was surprised to see some of their underage fans grinding along to it (err, okay…) The bass thudder that is ‘I Already Forgot Everything You Said’ was another clear fan favourite of the night, with the girl in front of me squealing to her best friend that this was her favourite song by them. Yes. Squealing. And screaming. With fans like these, I just don’t understand why the Dig aren’t more popular. ::tap tap:: Hey, BBC! Are you listening? These guys are ready for their shot at the big time. After emphatic yelling for “one more song!” from the audience, the band returned for an encore. I’m usually not a big fan of covers, but the Dig outdid themselves with a brilliant version of The Cranberries’ ‘Dreams’. They followed that up with the frenetically driving ‘Hole in My Heart’. It may have the emotion-tugging chorus “there’s a hole in my heart, she says it’s a friend / but I know in my heart she’s gonna do it again”, yet the tune is just so fun, you can’t help but shake a tail feather, it’s that catchy. And it marked the perfect end to a first-class live show. Excellent work, guys. If you happen to live in the New York City area, you have a chance to see the band one last time in 2014, playing the Pancakes and Whiskey holiday party on the 19th of December at Brooklyn’s Rough Trade shop. I went from the first taste of summer nights here in Washington, DC, the remnants of a glorious May Day in the mid-20Cs with just a sliver of a crescent moon hanging in the sky, to the first old school sweaty, crammed, pot-smoke filled house show I had been to in years with just a step over a threshold. I had been given a mere 24 hours notice that New York City band the Dig were playing at DC’s The Paperhaus. Running one of the city’s most active independent house venues and named after their very own local band Paperhaus, this venue is found in the upper reaches of residential DC and was crammed with a young, hip crowd carrying their Bud Light Lime-a-Ritas in a can with them, flowing in and out of the brownstone and out into the back alley. There were several bands on that night and each clearly had their own following as the crowd composition was completely different with each changeover. I got there late and was in the back, sat on the kitchen sink as it were, waiting for the Dig. The band opened with ‘Cold Afternoon’, the lead track from their most recent EP ‘You & I’. This song is a bit of a departure from their very dreamy, ambient fare. With strong vocals from David Baldwin, it was an excellent start to a live set. Baldwin on guitar and Emile Mosseri on bass shared vocals throughout the set, but if I could ask for one thing from the Dig, it would be that they embrace the notion of a frontman. It doesn’t hurt the flow of their live set at all, but I think it would help their recorded music. Often they treat the vocal line as an additional instrument, muted and floating. But from their live show, it’s easy to see how the vocals could take a commanding role. Easily their best song, ‘I Already Forgot Everything You Said’ hit us mid-set with its metronome-like drums and pingy keys eliciting excited “this is my favorite!” shouts from punters on both sides of me. I must say the new songs, such as ‘You and I Lost Control’ and ‘How Can You Trust a Feeling’ translate superbly into a live setting. There was some real grit, something to get your teeth into from those new songs, there is quite a bit to like. As we came to the end, ‘Black Water’ continued the fervor with a pounding beat and a well punched up crowd, leaving us with slow burner ‘Angeline’ to take us back out into the summer night. I often think of the Dig as background music. Live, they do an excellent job of commanding center stage. I am looking forward to the opportunity to see them play again. Their tour calendar is not yet filled out, but I am hoping for some more dates soon. After the cut: the Dig’s set list. When you’ve waited nearly 4 years to see a beloved band play, it becomes an event. When it was revealed to me earlier this summer that Newcastle’s Little Comets had signed to Nashville label Dualtone Records and they were coming over for their first headline U.S. headline tour, making a stop in DC, well, putting it mildly, I was beside myself. I wrote this In the Post article on the band’s ‘Adultery’ single in October 2009. That seems like ages ago and to be fair, it really is, as back in those days, I was still pretty new to the music writing business. Little (no pun intended) did I know that on this night, I would be pleasantly surprised by my city’s music brethren. I’m one of those people that believes in fate and I just got the feeling very early on, even before I’d met them on this night, that they were good people. They have a very good knack on picking good support bands to tour with, and just this year, it feels like a bit more than coincidence they’ve been on tours with or are due to go on tour with bands that are all friends of mine. They toured the UK in April with Sheffield’s Crookes in April, and later this month, they’re doing an intimate (snort) acoustic gig sponsored by Durex in Manchester supported by Bromley’s Van Susans. On Tuesday night, the opening band were New Yorkers the Dig, who I’ve known since they came to DC in February 2010 to support Editors. They would be supporting Little Comets in DC and on the next night at Philadelphia’s North Star Bar. How far the Dig have come and how they’ve evolved. Now with two albums (2010’s ‘Electric Toys’ and 2012’s ‘Midnight Flowers’) and an EP ‘Tired Hearts’, I feel like they’re truly coming into their own as the American band poised to hit the big time. (They just supported the Lumineers 3 weeks ago at Merriweather Post Pavilion. You do the math, folks.) While the crowd at the Hamilton generally kept a respectful distance from the band, there was one woman wearing a leopard print bra, holding up a beer can and who appeared to be quite inebriated despite the early starting time of 7:30 PM. She kept yelling and squealing all through their set, including shouting happy birthday at belated birthday boy and bassist Emile Mosseri. Besides this one distracting fan, there were clearly other Dig fans from way back who preferred to be seated; they made their presence known by shouting for requests for the band to play songs from ‘Electric Toys’ that sadly went unheeded. Instead, the band focused on songs from the 2012 release, including my personal favourite ‘I Already Forgot Everything You Said’ with its memorably thumping bass line, ‘Animal Screams’ and the dreamy album opener ‘Red Rose in the Cold Winter Ground’. The Dig are a fun band to watch; alternating lead singers Mosseri and David Baldwin have different vocal styles but uniquely compelling voices, and I find myself getting drawn in by their rhythms and my body just naturally goes with them. If you haven’t heard of them yet, have a listen to their music, I’ll bet you they’ll be touring in the UK in short order. 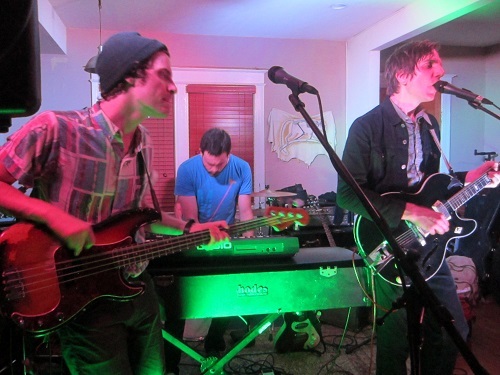 And then for the main event starting at the very early headlining set time of 8:30 PM came Little Comets. Even before they got onstage, there was one part to their stage setup that had me baffled. Hanging from what appeared to be a clothesline that traversed the length of the stage were, stage right to left a shaker gourd, a tambourine shaped like a moon and some kind of metal contraption. These were later employed by the band in a Clock Opera ‘A Piece of String’-kind of fashion at specific times throughout the set. I can’t really explain it any better than that but just imagine a band onstage playing guitars but then manically hitting these things hanging from a clothesline and you can sort of imagine the mental scene. 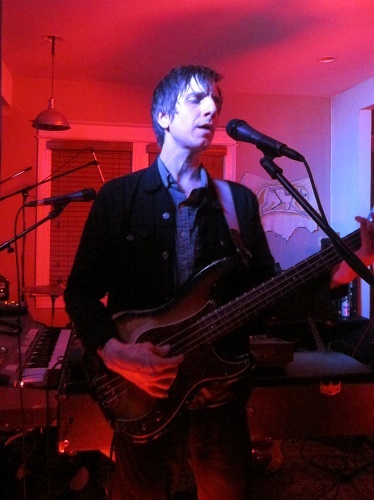 The band began their set with a taster of ‘Bridge Burn’, one of the special tracks added to the American version of Little Comets’ second album ‘Life is Elsewhere’ that will be available to us stateside next week. I think this song is brilliant, so it was with some disappointment that the song was truncated to segue quickly yet seamlessly into ‘W-O-E’, the band’s current single in Britain. When trying to explain to newcomers to Little Comets what they’re about, this is as good an example as any: lyrically erudite words by singer Rob Coles are sung in an distinctive way, backed up by brother and guitarist Mickey and bassist Matt Hall, all accompanied by unique and unpredictable song structures. Since they’re basically touring this new American release, I was under the assumption that songs from ‘In Search of Elusive Little Comets’, their debut album that went through great birthing pains (thanks a lot, Columbia) wouldn’t even be touched. However, the band next launched into ‘Isles’, with its spelling out of “B-R-I-T-I-S-H British Isles!” chorus. (They skipped the bridge naming so many great British cities, which was a shame.) Afterwards, Rob Coles commented with amusement, “it’s a little bizarre when people know the words…”, referring to the multitudes of fans including myself who were singing along to his every word. To be honest, I was surprised too; the first album was never released here, so I guess those kids got it off iTunes? (Let’s hope…) Song after song was met by admittedly strange whoops of glee from punters, including some that Coles himself complimented as sounding remarkably like that of cats meowing. Yeah, I know….but these fans were doing this out of love for the band and their music, so I’m not going to judge. To each his own! At the time and that age, I couldn’t really relate to what she said, but now I’ve come to know this first hand from the bands I now have the pleasure to call friends. It is truth. I’d add to her thoughts that nearly every single band I’ve met from the UK has a huge amount of heart and want so much in those hearts to make their passion for music their lives. Even though the guys of Little Comets have now settled down with partners and have children of their own, they remain uncompromising in their approach to making the kind of music they want to. And to watch them from their humble beginnings to where they are now, living out their dream out here in America, is something very special indeed. Thank you Little Comets, I feel privileged to have been part of your journey. Stay tuned here for my post-gig interview with Rob and Matt, coming soon on TGTF. After the cut: Little Comets’ set list.